If you’re a big enough comic fan to know who the eccentric Chip Kidd is, then this should get you psyched. A long time graphic designer and well known Batman fan, Kidd has finally gotten to write his own Batman story. In this lone graphic novel, Kidd has managed to craft a tale and style of Batman & Gotham City that builds on the entire history of the character with relative ease. This is the kind of original comic that will be remembered for many, many years. There are many things within Kidd’s new graphic novel that can be summed up in two phrases – “Old school” and “Off the beaten path.” Kidd has channeled the old Batman comics for this and while it retains that feel, it still works as a new story without being campy or feeling recycled. He also manages to touch on and profile characters that would normally only stay in the background of a regular Batman story. Along with the older style vibes and influences, this was a pretty big creative risk he took and luckily they all work in his favor. One thing about Batman that many writers sometimes skip out on is that he does have to appear out in public as Bruce Wayne every once in a while. Kidd has taken this concept to heart for Death By Design and wholly embraced it for the plot, which I really like. Too often the alter ego of the Caped Crusader is left out of stories entirely, but it’s handled with ease in this comic and is pivotal to the entire story. An underlying influence of this comic is 1930/40s serial adventure films and Dave Taylor’s artwork is a great representation of that Mise en Scène and it really fits the tone of the book. Taylor gets into the grit and grim of Gotham within the comic and though they’re spaced out around the story, he has it bookended with some really remarkable work that will be the reason this book is remembered. I’m really fond of the way Taylor does faces and expressions. 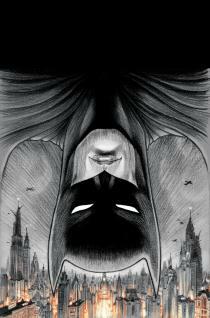 He’s got a style down here that shows a lot of depth to each character through just a few marks and lines, and with the plot of the comic being a deeply personal journey for Batman, the story is only enlightened by the art. While the comic is sometimes wordy and the first few pages of set up seem to drag Batman: Death By Design is a really good read. It has all the components that many would consider vital to a good Batman tale and its art is top notch. I’m hoping in a year or two we can get a good follow up to this. I like seeing 40s Batman with modern influence.